AMARAVATI: A senior assistant in the Medical and Health department in Andhra Pradesh’s Guntur district committed suicide alleging that he was denied promotion for many years and was harassed by senior officials. A self-shot video, wherein N Ravikumar listed the reasons for his suicide, surfaced on Facebook today. Mr Ravikumar was a senior assistant posted in the Community Health Centre at Ponnuru in Guntur district. He consumed poison two days back and died while undergoing treatment in a private hospital last night, a police official said. District Collector Kona Sasidhar ordered an inquiry into the incident even as the victim’s wife Pushpalata and Dalit organisations demanded strong action against the guilty officials who allegedly abetted Mr Ravikumar’s suicide. In the video, Mr Ravikumar alleged that he faced constant harassment from his higher authorities and was even denied promotion for many years. “I was asked to pay a bribe of Rs. one lakh to get my promotion cleared but I pleaded helplessness. As they insisted, I pooled up Rs. 70,000 which was my hard-earned money and paid them. Still, injustice was done to me. “I was the senior-most staffer in the department in the district but, not only denying me promotion, they also posted me to Ponnuru and not the DMHO office in Guntur,” he added. “Those who took money from me did not care and rather mocked at me saying I cannot do anything to them even if I die,” Mr Ravikumar said crying. Unable to bear the humiliation any further, he said he decided to end his life. “I don’t want to live anymore. OK, sir. Please take action at least after my death,” he said sobbing. The video surfaced on Facebook today following which some Dalit organisations staged a protest in front of the district medical and health office in Guntur, demanding action against the guilty officials. 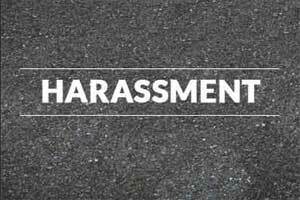 Mr Ravikumar’s wife Pushpalata said her husband had constantly complained about the harassment he faced and how he was unable to withstand it. “He submitted several petitions to the authorities concerned about his case but justice was not done,” she alleged. One of Mr Ravikumar’s three daughters said her father could not even sleep peacefully in hospital in the last two days saying “I see only their (officials’) faces if I close my eyes”. “What wrong did he do to warrant such mental harassment,” she questioned. There has been no reaction from the government so far on the incident. State Health Minister Kamineni Srinivas was in Chennai and could not be contacted.